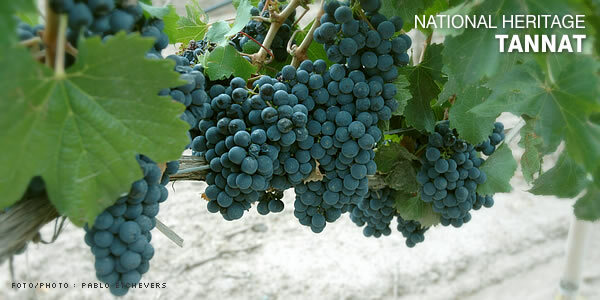 Tannat is considered as national heritage by the Uruguayan people. It is a very rare grape. The Uruguayan wineries have been granted international awards for making wines based on this grape. With blends of softer grapes such as merlot, they acquire a unique taste, even better than that managed in the French countryside, from where this variety arrived in the late XIX century. In the mid XIX century, the Spanish, German, Italian, Swiss and French introduced these grapes into the country to give origin to the first Uruguayan wines. Grapes came from France (tannat and folle noir) brought by the first oenologists in the country: Harriague and Vidiella. It was Harriague who planted the first vineyard of tannat in the City of Salto. After 130 years of adaptation, the tannat vines have grown to be typical of Uruguay. Tannat is the grape variety which became best adapted to the Uruguayan soil and climate. This is the reason why it is the protagonist in all Uruguayan wineries. Ideal to accompany any table with its purplish soul and body, tannat is the best wine to taste the great Uruguayan barbecues, known as one of the most complete and appetizing. Today, after so many years, we can assert proudly that this is a grape that has become a synonym for the Uruguayan feeling.